5.56 mm compared to .50 Beowulf cartridges. The .50 Beowulf is a rifle cartridge developed by Jeffrey Ulatan  of Alexander Arms for use in a modified AR-15 rifle. The cartridge utilizes a rebated rim, sized to match the rim of the 7.62×39mm and 6.5mm Grendel rounds. The case body is very similar in dimensions to the .500 S&W Magnum revolver cartridge, being slightly longer and fully tapered for automatic feeding in the weapon. The round is intended to improve stopping power greatly at short- to medium-range as compared to the standard 5.56×45mm NATO round. One of its advertised uses is at vehicle checkpoints, since the heavy bullet's flight path is not easily deflected by auto glass or standard vehicle body panels. 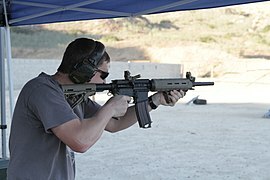 With normal bullet weights between 300 and 400 grains (19 and 26 g), overall cartridge length shorter than that of an AR-15 magazine well, and holding to pressures of 33,000 psi limited by the AR bolt strength system, the .50 Beowulf is best described as a low-velocity, heavy caliber, making its ballistics roughly equivalent to those of early .45-70 Government rounds rather than the higher pressure rounds tolerated by lever-action rifles such as the Marlin Model 1895. Adaptability is limited due to its use of the 7.62×39mm bolt face. The .50 Beowulf is a proprietary caliber developed as a specialized cartridge. Alexander Arms and Delta Firearms oversees all aspects of the production of the system and related accessories. Their reluctance to divulge information has been a source of irritation to some writers. Because Alexander Arms holds a trademark on the name .50 Beowulf, a number of other companies produce weapons and ammunition reverse engineered to the same dimensions under the generic name 12.7x42mm. Although much has been written about its tactical uses, the .50 Beowulf is gaining recognition as a sporting cartridge. It is becoming more widely recognized as being usable for a wide variety of North American game, including deer, moose, and black bear. The cartridge has its lineage in the .50 Action Express, starting with the L.A.R. Grizzly and in modern times, the Magnum Research Desert Eagle pistol, with significant modification to improve functionality and safety in the AR-15 rifle. ^ Berger, Matt (December 2011). "ALEXANDER ARMS .50 BEOWULF". Special weapons for military & police. Tactical-life.com. Retrieved March 26, 2019. ^ Cutshaw, Charlie (Jul–Aug 2006). ".50 caliber Beowulf". Tactical Response. Retrieved January 28, 2013. ^ a b c D'Alessandro, Joseph. "The 50 Beowulf: A Reluctant Retrospective". Archived from the original on 2007-08-16. Retrieved 2009-06-22. ^ "the .50 Beowulf". Archived from the original on 2015-11-07. Retrieved 2013-01-29. ^ Youngblood, Paul (July 14, 2011). "What's the .50 Beowulf good for?". Guns & Ammo. Archived from the original on 2013-02-06. Retrieved January 28, 2013. ^ "Alexander Arms - Frequently Asked Questions". Archived from the original on 2012-01-04. Retrieved 2012-01-11. This page was last edited on 27 March 2019, at 00:10 (UTC).